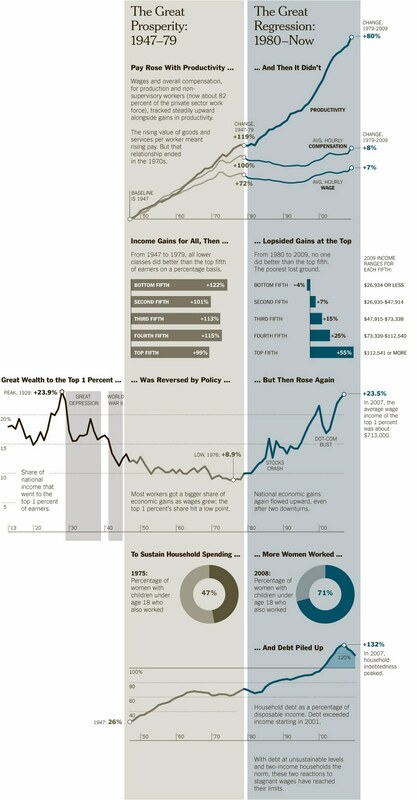 I love looking at data about income and wealth and poverty levels. I feel like we're so inundated with misleading information when people start talking about "the middle class" in relation to politics and taxes. A report was just released of Census Bureau Stats about real income before taxes-- it's good to note that this is different from the Adjusted Gross Income stats often reported when people are referring to IRS data. Since weathy people tend to take more deductions for mortgage interest, charitable giving, 401k contributions, etc., it's important to remember that their real income is much higher than their adjusted gross income-- so when politicians talk about taxes that might affect someone whose income is above $200,000, they mean someone whose real income could actually be much higher. Overall, median household income adjusted for inflation declined by 2.3 percent in 2010 from the previous year, to $49,445. 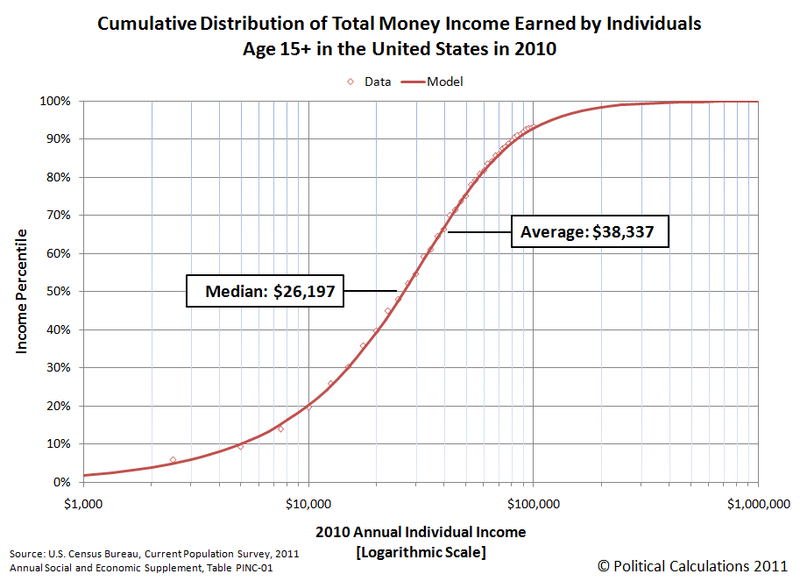 211,492,000 Americans over the age of 15 earned money in 2010, or 67% of total population. Interesting that it corresponds very closely to the total number of people age 15-64, presumably the ages of people you'd expect to work. But a lot more people are working past the age of 65-- about 8% of people over 65 had income in 2010. All stats are from this Census Bureau report and Wikipedia citations of Census data. For the households you have to remember that some are retirees, especially the single women. There is a big difference also between that income if you own a house and if you rent. Income and poverty statistics were great tool in determining and monitoring a countries economic status. Very interesting...thank you for posting this info! Those are some great statistics!. wow, this is actually really interesting. as someone blogging from the other side of the world (sydney, australia) I thought these numbers would be higher somewhere like NY. by the way I've really enjoyed your blog - I've just gone and read through your 'rules' and a stack of your past posts, and I've added a link to your blog on mine. hope you don't mind! Great work on breaking out all of the numbers into detail. It is amazing when you look at the numbers. It is hard to believe that so many people qualify for the poverty numbers. Just FYI, Schedule A deductions you mentioned, like mortgage interest and charity, do not affect AGI. They are deducted *from* the AGI. And since 401(k) deductions max out at $16,500, they aren't making a huge difference to the real income of those of making over $200,000. Taxable Income, on the other hand, could be quite different from either the real income or the AGI. I am a financial professional working gratis with middle to lower income class families. My goal is to better their financial situation. Even with expert advice on budgeting the tragedy is that as hard as these families work they have little disposable or investable income, much less benefits like health insurance or a retirement plan. Not much to work with here to prevent more poverty down the road for these families. the poverty level for a single person is 11,000.00 gross. After taxes if a person depending where they are in the country, can pay for their own housing and utilities, what about medical and dental insurance,let alone paying for washing drying and drycleaning clothing. public transportation and/driving owning a car and extras. kids, absence from work ,etc...it does not help career advancement. While all very legitimate and respectable reason, you could not discount them. I can tell that you don't do your own taxes. As Anonymous on 9/30 pointed out, taxable income allows personal exemptions and itemized deductions. AGI does not (that's why it's still called gross). AGI only allows deductions from business and rental activity and a few other items (such as student loan interest if you're under the income limits). AGI is the most important number there is. While you're right that taxable income can be misleading, gross income without allowances for business activity is also grossly misleading. E.g. you own a business which has total receipts of $500,000, but you spent $400,000 on the business over the course of the year. Which do you think is a more accurate figure for how much money you made, total gross ($500,000) or AGI ($100,000)? Obviously, it's AGI. You don't get to enjoy the $400,000 you spent maintaining your business - you only get to enjoy your profits.